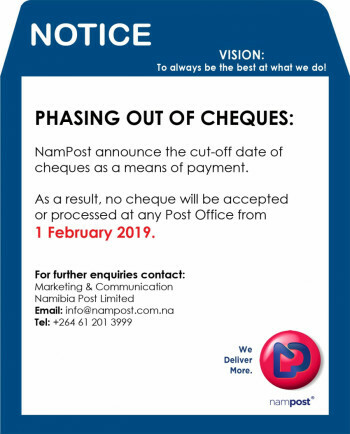 NamPost - We Deliver More. NamPost is the national postal operator in Namibia providing service solutions through its postal, banking, courier, philately, agency and money transfer services. Feel free to submit any queries and feedback on any product from NamPost from Philately, Postal Service, Courier to the NamPost Savings Bank. Do you have a question about one of our services? Our comprehensive list of questions our customers ask are answered here. Even you may submit a question! This is the largest Business Unit in NamPost, and encompasses Post Offices, Mail Services, Philately, and Agency Services. Pay for the following Products and services at all our Post Offices country wide. Postal Services offer a broad range of products and services which includes domestic and International Mail Services. Internal mail services are available globally. Conveyance of letter and parcels is done by Air or Air Surface depending on your requirements. You'll receive your new post box address and your keys once your application and payment have been processed. You'll receive two keys when you first lease your post box and you can buy extra keys at any time. Customs declarations are regulated by the statues of the Universal Postal Union, Customs and Excise Act and the requirements of destination countries. Customs Clearing Officials are on –site to speed up the clearing of you mail items. Download the latest list of products covering all tariffs for all services NamPost has to offer, and so much more. 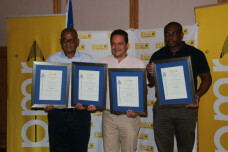 Stay up to date with the latest news and events happening in and around NamPost.